It can easily help you convert video to iPad MPEG-4, H.264/MPEG-4 AVC, MOV, M4V video format and AAC, MP3, WAV, AIFF, M4A audio format, and backup iPad files to PC. 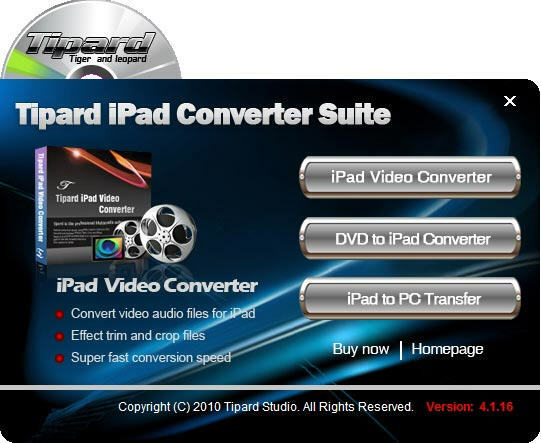 Tipard iPad Converter Suite is a necessary and all-in-one iPad converting software pack to help you convert DVD and any popular video format to iPad compatible video format. It provides you with the two fantastic iPad converters: iPad Video Converter and DVD to iPad Converter. It can easily help you convert video to iPad MPEG-4, H.264/MPEG-4 AVC, MOV, M4V video format and AAC, MP3, WAV, AIFF, M4A audio format. Apart from converting function, Tipard iPad Converter Suite also brings you the powerful editing functions. It can serve you as the video cropper, video trimmer, video merger, video watermarker and video effect adjuster. Tipard iPad Converter Suite can help you select audio track and subtitle for output video. You are able to preview the input and output video effect to get a full control of the output video. While during the process of previewing, you can capture your favorite pictures and save them as JPEG, GIF or BMP formats. You are able to convert one source file to different output video formats simultaneously. The user-friendly interface can make the converting operation quite easy to use. And it can finish the task with amazing speed. The DVD to iPad Converter software enables you to rip any DVD to iPad video formats, such as MPEG-4, H.264/MPEG-4 AVC, MOV, M4V, etc. Provides you with powerful function of converting any popular video format, such as AVI, MOV, MPEG, MKV, etc., to iPad. Tipard iPad Converter Suite can help you extract audio from video/DVD and convert it to iPad AAC, MP3, AIFF, M4A audio format. Trim any segment of a video, crop the video aspect ratio, join several pieces of video/audio together, and add a text/image watermark and set its position and transparency. You can easily adjust video brightness, contrast and saturation to get the customized output video. Also you can convert a interlaced video to a progressive one with the function of "Deinterlacing"
Tipard iPad Converter Suite enables you to transfer files from iPad to your computer for backup. PowerPoint to Video DVD - Converts PowerPoint presentations into video files and burn to DVD. BestHD Blu-Ray to MP4 Converter - Rip and convert Blu-ray DVD to MP4, AVI, DivX, XviD, and WMV.